Mysuru: Marking the 98th birth anniversary of Jayachamaraja Wadiyar, Ursu Chintakara Chavadi had organised a function at Sarada Vilas Centenary Hall in Krishnamurthypuram here yesterday. 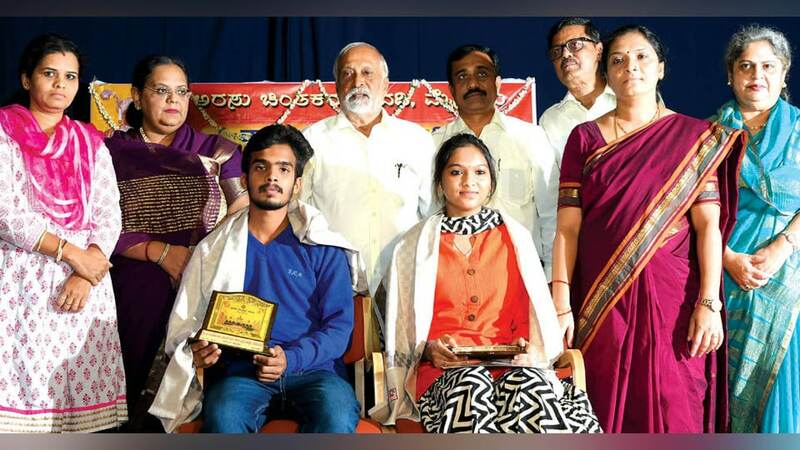 Pratibha Puraskar was presented to 34 children of Ursu community who had excelled in SSLC and PUC examinations. Scholarships were given away to 53 students. Senior members and achievers of the community were also felicitated on the occasion. The programme was inaugurated by Tripura Sundaridevi, granddaughter of Jayachamaraja Wadiyar. His daughter Kamakshidevi was the chief guest. A portrait of Jayachamaraja Wadiyar was unveiled by retired DDPI N. Nanjaraje Urs. Speaking on the occasion, MCC Commissioner G. Jagadeesha opined that the planning executed for the city during yesteryears were still valid today which is a testimony of the far-sightedness of the then Maharajas. The Wadiyars had a good concept of greenery in city and maintaining that amid development is tough proposition today. He added that plans were afoot to methodically develop 200 parks in city. He advised students to shun negative thoughts and to always have progressive positive thoughts to face the competitive world and come up in career. Chavadi President Kemparaje Urs presided over the programme. H.D. Kote Ursu Sangha President S. Lingaraje Urs and Devaraj Urs Backward Classes Development District Officer Somashekar were present.